The Parish of St Vedast is known from the 12th century, and the church is traditionally claimed to have been established by 1170. 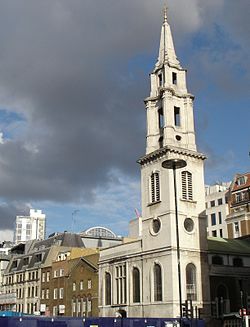 It has been altered, enlarged and restored many times and probably rebuilt at least twice, the last time by Christopher Wren, after the Great Fire of London in 1666. Having been completely burnt out during the Blitz of World War II, the church was restored under the direction of its Rector, Canon Mortlock, and a very influential Parochial Church Council that included Poet Laureate John Betjeman and master organ builder, Noel Mander.